Unmanned remote-controlled aircraft have been around longer than most people think. The Kettering "Bug," for instance, was developed during World War I. 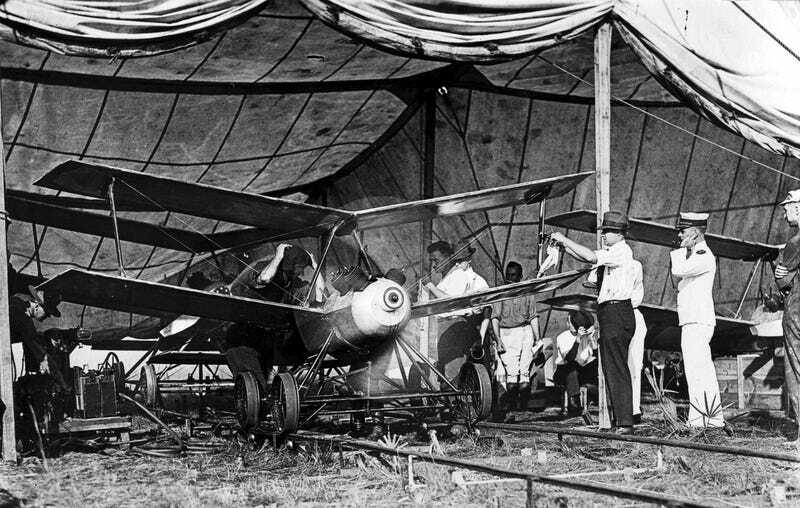 It was a bomb-carrying unpiloted biplane that flew on a pre-set course to its target. Once its autopilot was set, the plane was on its own. Prototypes were built and successfully tested, but by the time the Bug made its first flights the war was over. Nevertheless, it was the precursor of the modern cruise missile. One count against unpiloted aircraft was that every time one was used, an airplane and some complex machinery was destroyed. This made the use of drones an expensive operation. To say nothing of the fact that once one was launched there was no way to alter its course. Meanwhile, by the time of World War I, the development of the military rocket had pretty much reached as high a degree of perfection as it was to achieve until the 1930s. Rockets had the advantage of being a cheap way to deliver an explosive payload. That was a big plus. There was a major drawback to the military use of rockets, however. From the get-go, the problem was their unpredictability once they were launched. There was absolutely no way to control a rocket and no guarantee it would go in the the direction you wanted it. For this reason, rockets were launched in salvos of dozens or even hundreds at a time. The theory was that if you launched enough rockets, some at least would wind up where you wanted them. If there were only some way to combine the two ideas: the cheapness and power of the rocket and the control of the airplane. Dr. Henry W. Walden, a Massachusetts dentist, inventor and pioneer aviator (he built and flew the first monoplane in the US in 1909), figured there was a need to do something about this. It was 1915, the Great War was in progress and aircraft were already being equipped with rockets to be used against enemy planes. These were little better than ordinary skyrockets, though, and the chances of hitting another plane were as chancy as using rockets anywhere else. A pilot might be as likely to shoot his own plane down as the enemy's. Although Walden's patent was granted, it never became official: he never paid the fee, having received neither support nor interest from the US government. His idea wasn't vindicated for nearly a quarter of a century, when the first radio-guided rockets were developed by the Germans in World War II. Walden eventually donated his model to the Smithsonian's National Air & Space Museum in 1957, where it remains today. It has never been put on display.